Individuals with lung diseases may need extra oxygen in order to restore healthy oxygen levels. This extra oxygen can be provided through oxygen therapy. Oxygen therapy is a type of treatment that provides a patient with supplemental oxygen. It involves the administration of oxygen for both chronic and acute care in hospital or home settings. Normally, oxygen is delivered into the body’s lungs from air you breathe. Oxygen is needed by everyone and is extremely vital for normal physiological functioning. Atmospheric air contains 21 percent oxygen, which is sufficient for healthy individuals. Though, lung diseases and other conditions can prevent one from getting adequate amounts of oxygen. Common conditions that may require an individual to receive oxygen therapy are chronic obstructive pulmonary disease (COPD), pneumonia, asthma attack, heart failure, cystic fibrosis, and sleep apnea. An arterial blood gas test or a pulse oximeter can reveal the body’s oxygen level and determine if an individual needs supplemental oxygen. By providing patients with extra oxygen, patients with lung diseases can live normally, function better, and be more active. Oxygen is also widely used as an emergency medicine for first aid and emergency hospital situations. Overall, oxygen therapy helps improve one’s daily functioning. Studies also show that oxygen therapy can also lengthen the lives of COPD patients. An oxygen mask is a medical device placed over the nose and mouth to supply oxygen. Oxygen masks are especially used when a patient suffers from respiratory ailments and cannot get enough oxygen from the air. Surprisingly, oxygen is considered a drug medication and must be prescribed by a physician. The physician determines the amount of oxygen needed at an exact setting and rate. Too little oxygen can result in fatigue and too much oxygen is not good for the lungs. Oxygen masks be used for short-term and long-term therapy in both home and hospital settings. The oxygen can be supplied from a metal cylinder or other containers. Oxygen is flowed through a tube from an oxygen source and delivered into the lungs via the oxygen mask. It is important to know that oxygen therapy can be a fire hazard. If used at home, proper training and equipment is necessary before administering oxygen therapy. Three common types of oxygen masks are simple oxygen masks, nebulizer masks, and venturi masks. The choice of oxygen therapy device depends on the patient’s oxygen need and the efficacy of oxygen mask. Each type of oxygen mask is designed for specialized therapy. Simple oxygen masks, also commonly known as simple face masks, are basic disposable plastic masks that are used to provide oxygen therapy. It is commonly used for conditions such as chest pain, dizziness, and minor hemorrhages. 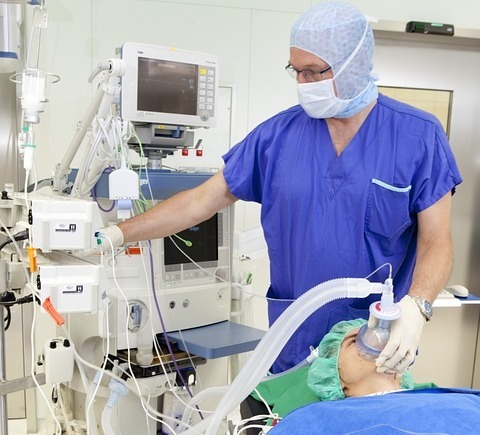 Simple face masks (SFM) are only designed to be used for patients that are able to breathe on their own but simply need a higher oxygen concentration. Simple oxygen masks are designed to deliver 40 to 60 percent oxygen at 6 to 10 liters per minute. These face masks can be uncomfortable and confining as they block the mouth. Venturi masks are a specialized oxygen mask with venturi devices that mix the oxygen with room air to create high-flow enriched oxygen. They are high-flow oxygen therapy medical devices that are capable of delivering a precise oxygen concentration to patients. It is primary choice of treatment for oxygen delivered and are especially used when needed to control carbon dioxide retention. Venturi masks are typically designed to accurately deliver 24, 28, 31, 25, and 40 percent oxygen. Venturi masks are especially used to prevent respiratory depression in emphysema patients who cannot fully inhale. Nebulizer masks are specialized oxygen masks that are used to deliver topical medications to the body’s airways. By utilizing compressed gas, nebulizer masks propel liquid medications into aerosol for delivery into the upper and lower airways. They are a more efficient medical device to deliver aerosol medications. Nebulizer masks are placed over the nose and mouth to directly treat the breathing passageways and the lungs. It is especially useful for patients with lung diseases. When used correctly, the nebulizer allows for better chance to reach into the airways to increase effectiveness. StaySafe Medical Clothing manufactures affordable oxygen masks of the finest quality. Our oxygen, venturi, and nebulizer masks are manufactured with CE, ISO, and USFDA certifications. Made with premium polyvinyl chloride material, StaySafe oxygen masks are designed for both consumer, hospital, and clinic use. StaySafe aims to provide high quality medical clothing to meet the demands of the developing world. Our superior standards and competitive pricing sets us apart from other manufacturers. Looking for an oxygen mask manufacturer? Inquire with us today if you are interested in distributing our medical clothing products.